Prepare for Halloween with Illamasqua’s The Pro Edit: Vampy; a carefully selected makeup collection. Host to a luxurious eyeshadow palette, contouring gel and deep berry lipstick, the makeup collection arrives in Halloween themed hues, perfect for fancy dress or for looking glam at a themed party. Each product guarantees to deliver a spookily professional finish. Achieve stunning eyes with the Demise Palette; boasting four highly pigmented eyeshadows in both matte and shimmer finishes. A member of the Extinct collection, the palette is home to the fan favourite shade ‘Gimp’ and a trio of other long lasting powder eyeshadows, guaranteed to transform your look. Gimp: A matte black/navy shade. Wilt: A shimmering red/gold copper shade. Lost: A shimmering white/gold shade. Achieve a sculpted and chiselled complexion with the Contouring Gel Sculpt in 'Silhouette', a sheer contouring gel that helps create subtle, natural-looking definition on the contours of your face. Perfect for defining your cheekbones, jawline and forehead, the gel formula creates delicate shadows on the face; apply to facial contours where shadows would naturally be cast. It enhances your face shape to enliven natural features. Easy to blend, the formula will leave your face looking naturally chiselled and sculpted. Add sumptuous, hydrating colour to your pout with the Glamore Lipstick in ‘Vampette’. Enriched with moisturising Vitamin E, the long-wearing lipstick glides on effortlessly to soften and condition, whilst delivering a luscious, deep berry hue in just one stroke. Lips are smooth, comfortable and defined. Demise Palette: Use an eyeshadow brush to apply and build colour intensity, soften edges with the blending brush to create a soft smokey effect. Intensify the lash line, using the deeper shades with smoulder brush. Gel Sculpt: Using your fingers or a highlighter brush, apply Gel Sculpt across the temples, hollows of the cheek and jawline and blend gently. To be applied prior to setting foundation. Lipstick: Apply directly or use a lip brush. I love this set! The lipstick has the perfect colour. First I was afraid because the colour in the picture looked darker and not as wearable as it actually is. The eye shadow colours are also amazing and I love the texture of them. After applying the contouring stick you are left with the most natural looking contour. 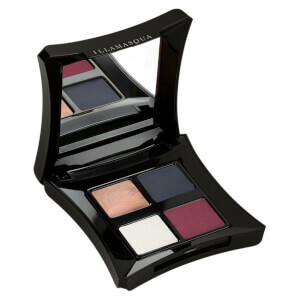 Illamasqua vampy trio is a must have no matter what.Looks beautiful on your dressing table or even on your bathroom floor. Seductive packaging with decadent allure.Quality of make up is superior,easy to glide and build up for intense colour.Easily removed yet long lasting. Colours are inviting to the imagination.I have used Illamasqua for over 15 years and still have my old products around just as display since they are so decadent.My only wish is that the company reintroduce the large black creme eyeshadow. Wearing this quality vampy trio is a trip.